Caffeine Free (uncharged) Box of 20 sachets. INGREDIENTS: MAX BHB, R Beta Hydroxybutyrate, Vitamins B6 & B12, Amino Acid Blend (L-taurine, Fermented L-Leucine), Butyrate, AC- 11 DNA Repair (Inner Bark of Uncaria Tomentosa). Citric Acid, Natural Flavours, Calcium, Sodium, Potassium, Erithritol, Stevia, Xantham Gum. Why would I take Pruvit Keto OS Key Limeade MAX? The wonderful thing about taking exogenous ketones is that you can experience the benefits of ketones without diet modification. Even those who don’t change a thing, will still experience the benefits. However, it is encouraged that you slowly begin to follow a lower carbohydrate diet, and enhance your body’s ability to utilize. However, for maximum benefits we, at Keto Supplements Ltd., recommend following a ketogenic or low carb diet. This is because it is unnatural to have both ketones and glucose in the blood simultaneously. 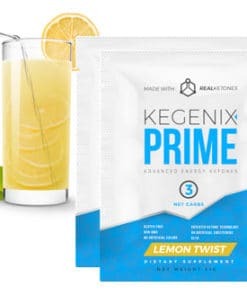 Pruvit Keto Key Limeade Max is a natural, nutritional ketone supplement that gives your body the ketones it needs in order to enter into ketosis and achieve the benefits of ketones via supplementation.